Pain and Performance Solutions utilizes a range of body work systems such as Active Release Technique (ART®), Selective Functional Movement Assessment (SFMA™), NeuroKinetic Therapy (NKT®), and Proprioceptive Deep Tendon Reflex (PDTR®) to aid muscle recovery and fix muscular dysfunction. As it turns out, the brain is the key to healthy movement. The more I learn about the human body, the more I see that everything to do with healthy movement is centered around the brain. Don’t get me wrong – this doesn’t mean that in order to fix movement problems we have to open up the skull, quite the contrary. The way to solve motor problems is to fix the broken communication between muscles and the brain. In fact, there are many aspects of motor control that resemble control systems from my engineering background. The muscles provide information about their state to the brain – but only the brain can control them and tell them how to move, how much default tension to have, and how long they should be allowed to stretch before contracting. At Pain & Performance, We want to provide you with the very best care, so the need to learn new techniques and bring in great technology is vital to our success and most importantly, to getting you your body working at its healthiest level. We are proud to offer the Vasper System to our clients. The Vasper System, developed by NASA, will help us get your body working at it’s healthiest of levels. 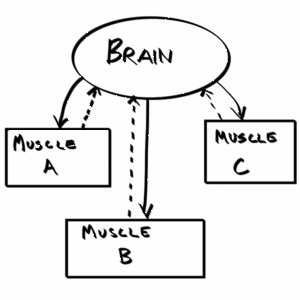 So what happens when the signal the muscle sends the brain is false? Say you injure a muscle and damage a receptor, or are sitting at a desk too long and not getting enough blood flow. Regardless of the cause, the muscle starts sending bad information back to the brain, bad information that the brain then acts upon by setting up a compensation pattern. The brain is highly involved, intelligent, and intuitive – so most compensations go by unnoticed. In order to understand this compensation and reverse it, it’s helpful to know how it is structured. 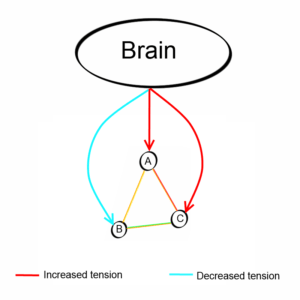 Much like structural engineers use a triangle to distribute shear forces into compressive and tensile loads (where materials are at their strongest) – the brain sets up triangular compensation patterns by increasing and decreasing tension in muscles, also in a triangular pattern. Often a compensation pattern will be effective and the body will continue to use it indefinitely or until by chance it gets reset. Other times a compensation will become so dysfunctional that it will create additional compensations – resulting in a 3 dimensional pyramidal pattern that can grow so large that nonsensical and seemingly completely unrelated muscles to the original are affected. Eliminating this compensation and restoring proper function of the muscles is the primary purpose of a technique I use called NeuroKinetic Therapy™. Through specific muscular challenges, the primary source of the dysfunction can be identified and eliminated – and then reinforced with at home exercises and release work. Our techniques include ART®, SFMA™, AiM, NKT, and P-DTR®. Visit our page to learn more about them. Julian Corwin’s journey took him from Engineer to specialized body worker. Read more about how he applies his skills for you. Every body is unique and so are the solutions to getting them moving like they should. Read more here.